Hi, I just came across your blog. I also have a hard time getting posts from my head to the computer. I am always jotting down tid bits that I could write about and still don't seem to get my ideas going anywhere. Beautiful quilts. 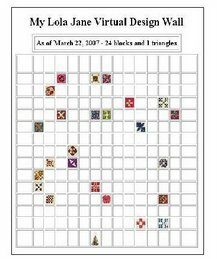 What is the Lola Jane Virtual Design Wall thing?